Since there are so many amazing healthy food bloggers that are part of the Recipe Redux, it was hard to pick a site to cook from. In the end, I headed over to Steph's website The Grateful Grazer. I am always drawn to her site because of her amazing photography and quality content. Steph is a fellow plant-based RD foodie who focuses on an un-diet approach to healthy eating. I love her philosophy of focusing on intuitive eating instead of strictly counting calories, fat grams, etc. It seemed like a no-brainer to recreate on of her delicious, mouth-watering recipes for this month's theme. I was perusing her site to find something that would satisfy both my hubby and I for dinner when I came across the Buffalo Roasted Chickpea Bowl. Any type of macro-bowl has me sold and anything buffalo-style is right up my husband's alley. This recipe received two thumbs up and was SO easy to pull together, too! Sometimes I turn my head at recipes containing roasted chickpeas. Usually this means a tedious task of draining, rinsing, and drying the chickpeas. Then, roasting them separately and still having the remainder of the recipe to prepare. That's not the case with Steph's bowl. 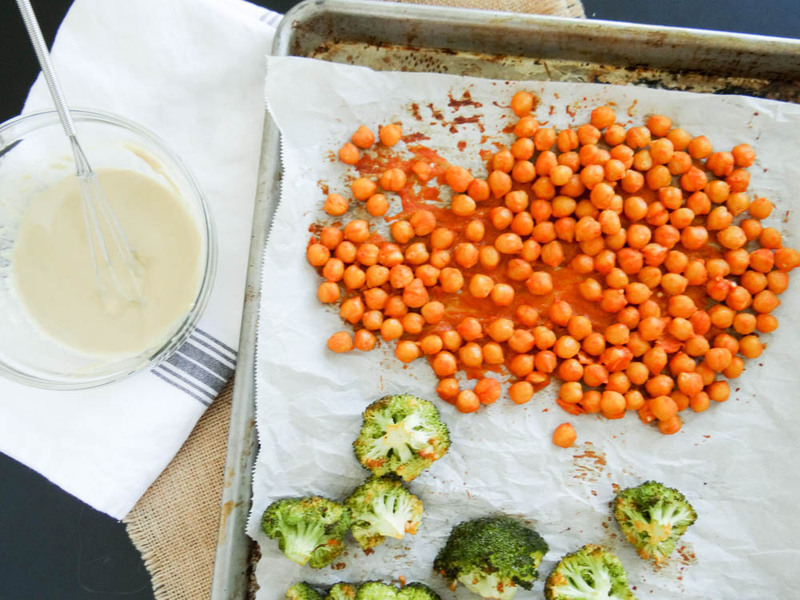 The chickpeas and broccoli are roasted together for a quick 20 minutes on the same baking sheet. While these are roasting away, you have just enough time to cook up some quinoa and whisk together the delicious sauce. It's the kind of recipe I wished I had doubled because it was so easy and so good! Head on over to The Grateful Grazer to see the recipe. Be sure to check out her About page and other amazing Recipes.